We all have our unique author’s voice. It’s as individual as a snowflake. It gives us our own tiny place in the universe of thought. Something profound happens when a child thoughtfully writes. It can bring reason and perspective to a young mind. 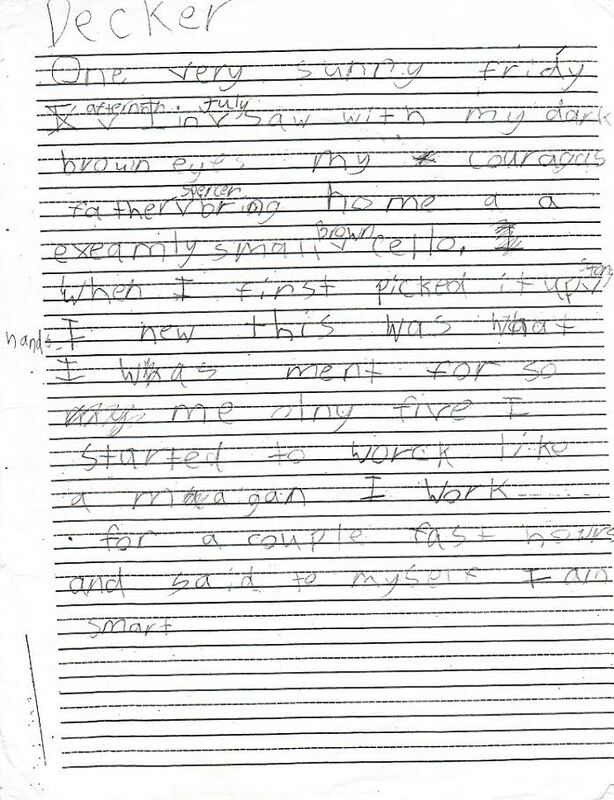 Decker, a second grader wrote the following in one of my writing workshops. I haven’t corrected his spelling or punctuation. One very sunny fridy afternoon in July I saw with my dark brown eyes my couragas father Spencer bring home a exeamnly small brown cello. When I first picked it up in my tiny hands I new this was what I was ment for so me only five I started to work like a maagan (magician). I work for a couple fast hours and said to myself I am smart. Every time I read this young author’s words I am inspired. Author’s voice represents deeper thought. It is understanding and not simply knowing. It brings consistency in an inconsistent world. It is that magical thing that turns wishes into hopes. It can make you feel smart. Below is a copy of his story.